Named for a modern art movement founded by Kazimir Malevich, characterized by the study of limited geometric shapes, these mitts feature a textured colorwork pattern set off nicely with the skewed join of these mitts. 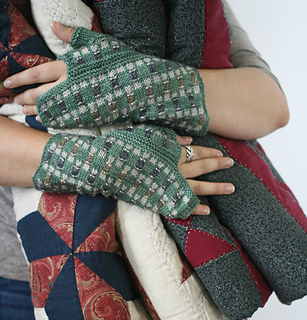 They are knit as a rectangle, but joined with an offset so there is one corner of fabric spread up the fingers and one down the arm. The bias of this offset rectangle makes for a comfortable fit through the wrist. Needles: 2.75mm (US 2) for flat knitting or size needed to obtain gauge; plus DPNs or circular needle for magic loop in the same size for the thumb; spare needle of the same or smaller circumference for three-needle bind-off. Gauge: 28 sts & 38 rows = 4 inches (10 cm) square in colorwork pattern after blocking. Stitches Used: knit, purl, k2tog, stitches slipped stitches wyif, ssk. 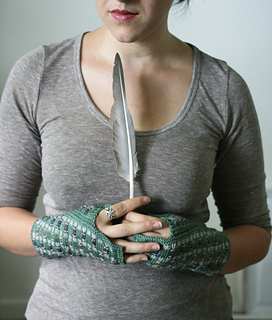 These mitts are worked as a rectangular piece that wraps around the wrist so that the cast-on stitches constitute the length of the mitt. 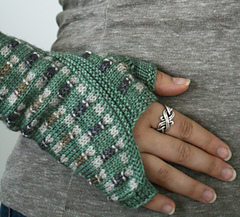 The hand circumference sizing depends on how long you knit the piece. It is highly adjustable if you are between hand circumference sizes. The thumb opening is made by binding off and casting on again as if you were making a wide buttonhole. 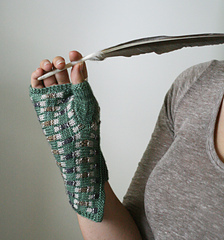 To keep both colors attached across this gap, both the bind-off and the cast-on should be worked alternating between the MC and CC being worked. Be careful to keep your tension loose here.